If you’re in the Miami area and looking for something to do, book a tour to go through Vizcaya Museum and Gardens. Our kids were so impressed and loved it so much that they still talk about earning enough money to one day buy Vizcaya! 😉 It’s truly a historic treasure located on the outskirts of Miami, Florida. James Deering- the creator and owner of the estate- modeled his home after a centuries-old Italian home. The home took about a decade to plan and complete. He spared no expense on the magnificent architecture, furnishings, and landscaping. It was originally 180 acres, including the home and gardens along the waterfront and a portion being for the house staff, animals, farming, etc. Although we were in a hurry to see everything before moving on to other events, we still enjoyed the tour and felt like we saw what we needed to see. The tour took about 2 ½ hours (for the home and gardens). Each room had plaques indicating their purposes and/or stories pertaining to the room. There are some sets of stairs so keep that in mind. The kids’ favorite place to see was the swimming pool. At one end of the pool, there are vaulted arches and windows looking into the cafe the museum. The waterfront views are astounding! We really enjoyed walking on the outskirts of the property along the banks of the water and seeing the variety of plant life. And, of course, the kids REALLY enjoyed seeing the iguanas in their natural habitat. We were impressed with the combination of cultures, styles, and technological advances during that time period (a water filtration system, heating, two elevators, ventilation, etc.) If your group doesn’t include children then plan to spend another hour for the tour. Vizcaya tours vary in price according to the type of tour you want. There are audio tours, guided tours, and reserved group tours. Admission includes access to the home and gardens. Pricing is usually around $18 per adult and $6 per child from ages 6-12. Children under ages 6 are free as well as military. Guests 62+ years old, wheelchair bound visitors, and students with ID’s receive a slightly cheaper admission rate. 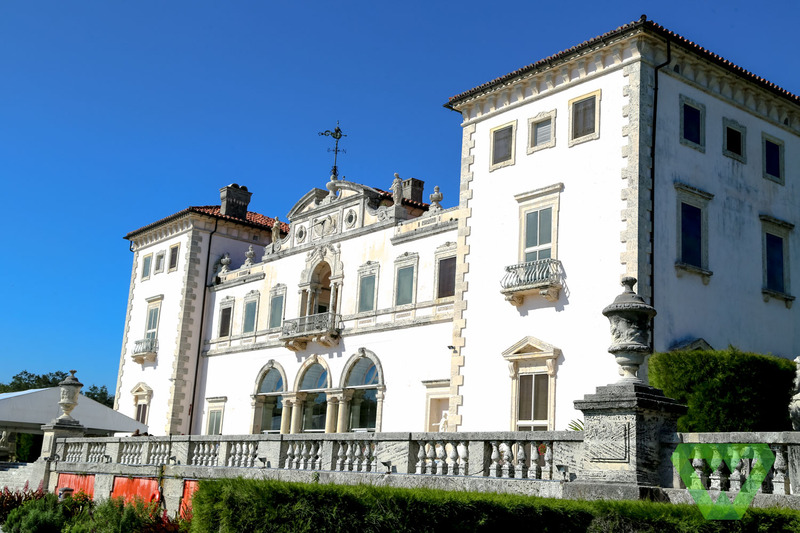 Vizcaya is open from 9:30-4:30 except on Tuesdays, Christmas Day and Thanksgiving Day. Cameras are not allowed in the home but there is a book for purchase with pictures and the stories/ information about each area of the property. The cafe is attached to the gift shop- along with restrooms. This area used to occupy Deering’s billiard’s room, bowling alley, and changing rooms for his guests. There are opportunities for photo shoots and facility rentals. Weddings, receptions, commercial photography and filmography are often done. Be aware that there may be a deposit required. Check the website or give them a call for more information. We really were pleased with the tour and impressed with the staff, facilities, and atmosphere. We recognized the hard work that is put into maintain the property and museum, cafe, and shop. We highly recommend doing a self-guided tour and spending time on your own. For more information about Vizcaya, call them at (305) 250-9133 or visit their website at http://vizcaya.org.